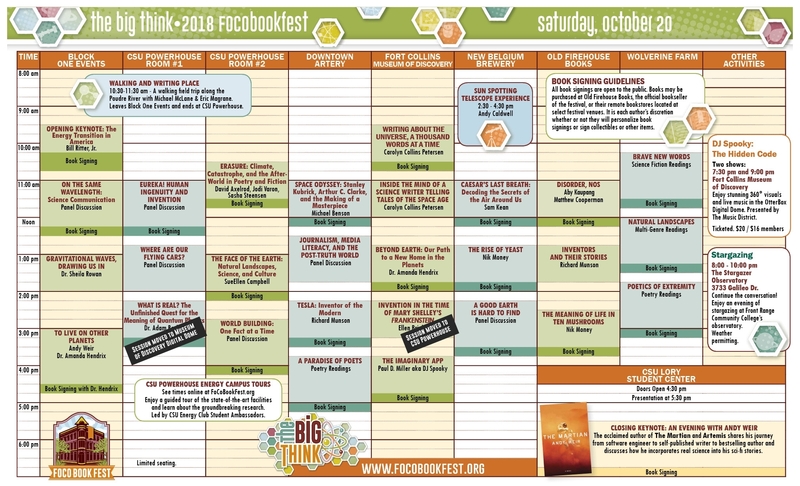 Printed programs will be available at all Fort Collins Book Fest venues on the day of the festival and at other select locations throughout Old Town beginning October 1. All Poudre River Public Libraries locations will have printed programs available ahead of the festival. You can download a copy of the entire program (PDF) or preview Saturday’s updated schedule (PDF). NOTE: author lineup and sessions are subject to change post-printing. Please see venue signage and this website for updated information. *Schedule and author participation is subject to updates. The most up-to-date information will be made available on the home page of the FoCo Book Fest website. Questions? Call the Poudre River Public Library District’s Answer Center at 970-221-6740.